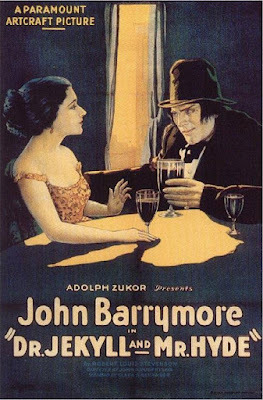 Last night at the Triple Door I enjoyed my final archival screening of the 43rd Seattle International Film Festival: Dr. Jekyll and Mr. Hyde (1920), starring John Barrymore and accompanied by the Austin, Texas-based combo The Invincible Czars. The Barrymore films I tend to watch are from his ravaged years in the thirties, where he was still great, but not at his best, so whenever I get the opportunity to see him in his Don Juan, dashing prime, I often find myself surprised by how alive he was only a decade before. As Jekyll and Hyde he is lively and grotesque, full of mischievous energy and dangerous appetites. Like Orson Welles, you can tell how much he delights in transforming himself physically, glorying in his false nose, prosthetic fingers and horrifying skull dome, all things which could look ridiculous on a less adept performer. This adaptation of the classic novel is not as explicitly racy as the pre-code take with Fredric March, but Barrymore makes his lascivious intentions quite clear. In some respect his Hyde's horrific behavior is not so far removed from that of Jekyll in his natural state; both are obsessed with their needs and oblivious to the damage they cause in pursuing them. It's just that one lays claim to morals and knows how to behave in high society. It's an intense, efficiently paced film with a gut-churning forward momentum. Danger always seems imminent, giving you the feeling of trying to step on the brakes in order to relieve the unease. I think it is one of Barrymore's finest performances, because he was given the freedom to explore the extremes of these dual personalities and embrace the ugliness the actor always seemed to see within himself. I've always believed that a silent movie score and those who perform it should not draw attention away from the film. For the most part I still feel like the music should be so intertwined with the film that you essentially forget that the musician(s) are there. However, I found myself feeling more flexible on the matter after watching this performance. The Invincible Czars have created an unpredictable, engaging score and I enjoyed the spectacle of their performance as much as I appreciated the film. I was able to take in both, side-by-side, without feeling like I'd sacrificed much of the cinematic experience. Instead of accompaniment, it almost felt like an enhancement. I think in many cases, approaching music this way can be disrespectful to the film, but with the right title, tone and musicians, I now see how it can work. Part of the appeal of the score was that it smoothly melded nostalgia with more modern sounds. Drifting, moody themes from composers like Satie and Debussy were woven into the band's own compositions, which focused on capturing the feel of the film in a visceral way. Manic laughter, hissing and repetitive vocalizing helped to draw out the horror on the screen. It was an interesting experience, and a concept that could only succeed with a careful combination of elements, but it did here. Check out my full SIFF 2017 coverage here.